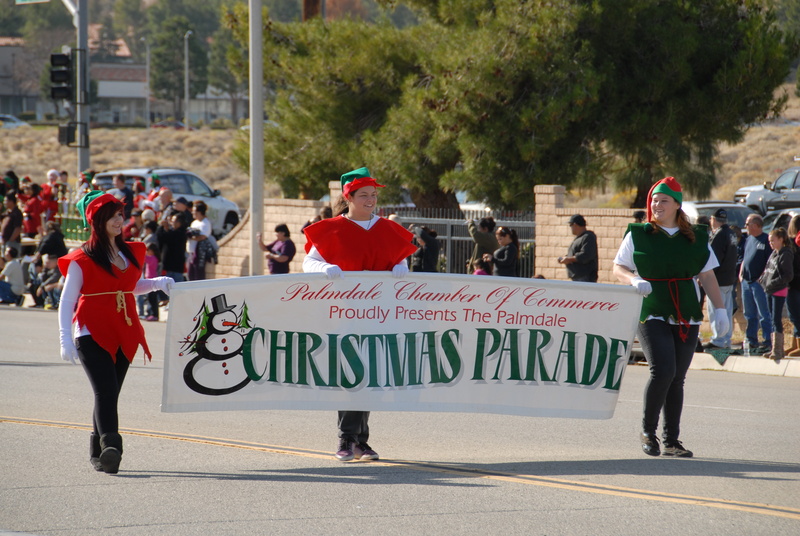 Palmdale, California – I got the call on Friday to photograph the Palmdale Christmas Parade. Unfortunately I had another engagement at the same time. I ended up splitting the difference; leaving the parade early and arriving to my initial appointment late. Officially, the parade is named the William J. “Pete” Knight Christmas Parade and is sponsored by the Palmdale Chamber of Commerce. This year’s parade had the theme “A Celebration of Family”. Usually the parade heads down Palmdale Blvd. so that’s what I was expecting this year…until I looked up the starting time and found the course had been changed. Now it would travel north on 5th St West, running between Avenue Q and Technology Drive. From a traffic standpoint, this was a much better route. 5th Street West is much less travelled than is Palmdale Blvd. There are fewer businesses along the route, and the majority of the ones that are on the route could still be accessed during the parade. As a photographer I had to plan where I was going to post myself for the best view under the day’s conditions. The main problem was that instead of running east-west, the parade would be running north-south. That meant the late-autumn sun would be a huge factor when shooting southward. And that is the direction the procession would be coming from. The only way to eliminate the sun from my shots would be to stand on the east sidewalk and face southwest. Arriving early, I staked out a spot with a good patch of sky in the background. The buildings that would be in the frame looked nice and did not create a distraction. Though the route wasn’t long at all, I still wanted to catch the participants early on along the route so they would still be fresh. (Is that really important? Look at the faces of the marching bands and other walking performers at the end of the Rose Parade). The view of the oncoming procession was unobstructed. Unusually warm weather here in the Antelope Valley for this time of year was icing on the cake. So far so good. But, being December in the High Desert of California, the morning sun was quite bright and reflected off anything even remotely shiny, including the asphalt. Using the spot meter was a quick thought but that would have resulted in blown-out backgrounds in almost every shot. Matrix metering worked better. I only had to touch up a handful of shots and only had one unusable one. That one was of a huge black and chrome vehicle. The chrome reflected the sun so harshly that the lettering on the side was completely obliterated. Combined with the black color of the rest of the vehicle, my poor Nikon didn’t stand a chance of exposing it properly. The black asphalt looked almost white in the photo. But the D200, amazingly, caught the driver behind the windshield even through the glare! One really good thing about photographing smaller parades – aside from not having people decide to stand in front of you at an inopportune moment – is being able to walk a couple of feet out into the street to get a better angle on the subject. With people facing forward and backward on various floats, being able to move around like that makes it possible to have more faces in the shot. Being a photographer at events like this does have it benefits. When people see your camera, they’ll turn and look directly at you and give you a smile and a wave. I was surprised to see so many people I knew in the procession. When I called out to them, not only did they turn around, but everyone riding on the float with them turned around. Big smiles at being recognized, big waves, everyone looking right at you, perfect shot! As parades have a tendency to do, the procession occasionally stopped while some of the participants up ahead performed for the judges. Taking advantage of this, I was able to get a few really good images. And I was able to take a few moments to enjoy an event that I was photographing. That doesn’t happen very often. In most cases it’s shoot, shoot, shoot now and enjoy the event later when editing the results. As I mentioned earlier, I had another appointment and was unable to see the entire parade. Click the link and you can see what I did get at this year’s Palmdale Christmas Parade.